Andrzej Wajda’s Man of Marble (Człowek z marmuru, 1976) bursts with iconic images, costumes and gestures, from the poster-sized portrait of ‘worker’s hero’ Mateusz Birkut (Jerzy Radziwilowicz), to the blue denim worn by film student Agnieszka (Krystyna Janda), to the nervous, purposeful way she has of chain smoking cigarettes. That such images become so insistently memorable, is due partly to the way Wajda frames his characters and partly to the timeline of the film, in which Agnieszka – film crew in tow – charges around Poland in pursuit of the truth of the rise and fall of socialist hero Birkut, barely resting in the attempt to finish her diploma film despite the objections of her supervisor at the TV station. A filmmaker on a mission, Agnieszka is perpetually in blue, moving constantly forward, rarely seen without a cigarette throughout the film’s pacey runtime. The origin of the film was a newspaper article seen by Wajda in the 1960’s, which described the plight of a working man unable to find employment, despite his previous status as a symbol of socialist labour, elevated to a standard of heroism by the State. 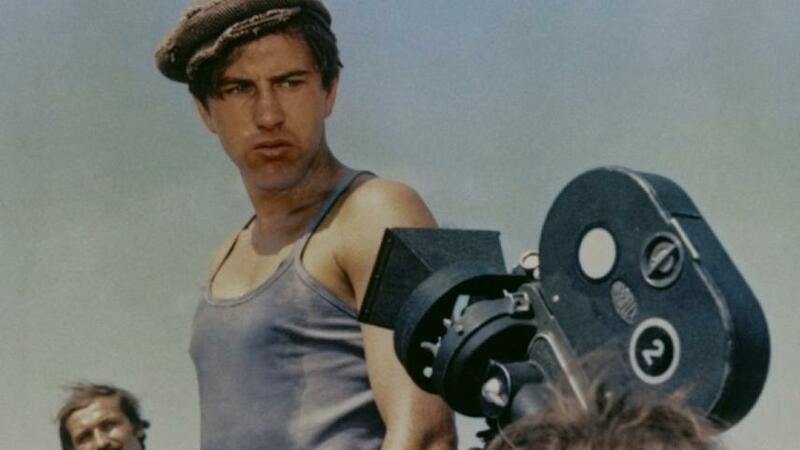 Wajda asked Aleksander Ścibor-Rylski to write a script based on the article, but in the 1960’s the socialist project was seen as too risky a subject to tackle by the authorities and so work on developing the film came to a halt. It wasn’t until 1976 that Wajda was able to restart the project, with revisions to the script and the character of film student Agnieszka driving the plot forward, framing the story of investigating Birkut just as Thompson (William Alland) searches for the truth about Rosebud in Citizen Kane (1941). Just as Agnieszka tries to find the person behind the image of Birkut, Wajda frames his female lead as an image – frequently at low angles as if to show Agnieszka as a towering statue – a symbol of passionate creativity in her blue denim uniform. Andrzej Korzyński’s soundtrack also goes a long way to cement the image of cool strength that Agnieszka embodies, with groove-heavy synths used heftily at moments when the young filmmaker’s purpose appears most clear. The contrast between Agnieszka’s self-assurance and Birkut’s unassuming nature is one of the key points of focus in the film. Early on, we see the intrepid reporter viewing unused footage of Birkut shot by star filmmaker Burski (Tadeusz Łomnicki, also seen in Wajda’s Innocent Sorcerers) in which his discomfort at being filmed and naïve manner is a source of fascination for Agnieszka – perhaps perceiving this to be the defining characteristic that allowed him to be manipulated into representing socialist ideology. Celebrated on its release in defiance of the censors that attempted to limit Man of Marble’s distribution, Wajda’s film appears today as a sharp critique of Stalin-era Poland, with a truly inspirational female lead, representing the filmmaking process as a fight for an autonomous voice in a male-dominated world, and the attempt to forge a formidable creative presence that might do justice to the idealism of her subject. Beautifully restored for this release (restoration fans will note the image comparison feature on disk 2) by Second Run DVD, with fascinating interviews with the director, Krystyna Janda, and ‘unofficial’ assistant director, Agnieszka Holland. Fans of the damn catchy soundtrack might also note a new release on vinyl last month.